This pigment is gained from the Copper Hill Mine in the southeast corner of Tennessee. Primarily consists of hematite (45%) and magnetite (41%). 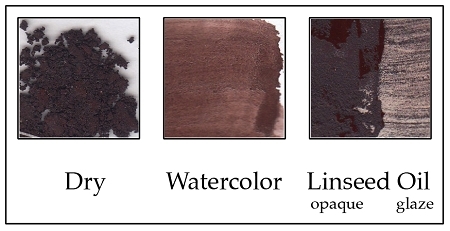 This rich color yields a strong saturation, even in watercolor glazes. I mentioned before that the champion mines pigments are good but some are really moist and must be placed in glass tray for a few days to dry out before securing in mason jar. Seriously. Do it. I bought four types and this one in particular was the last I get around to drying. It was packed in mason jar for only a month, and it now does indeed smell like "caput mortuum" (dead head(s), in Latin). Hopefully smell will disappear once completely dried.